5.58 points at 19 votes (rank 707). Already the first level of I, Ball a mess of balls starts. 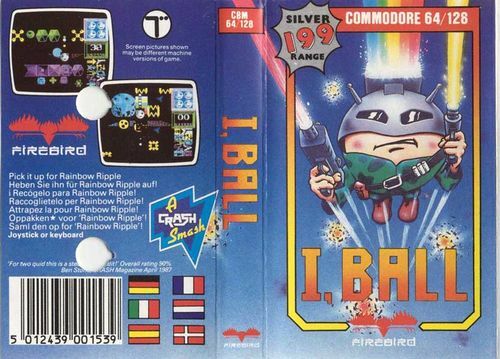 I, Ball is a vertically scrolling shooter by Firebird from 1987. Iball, the hero giving the name to the game, sets forth to rescue his spherical colleagues from the claws of the terrible Terry Ball. The game has 16 levels and after every fourth survived level one of the four friends is rescued, which are - Beware, groaner alarm! - the loveable "Lover Ball" (with lipstick and ribbon loops), the fruity-healthy "Eddy Ball", the globus-resembling "Glow Ball" and the noble "No Ball" (a crown). At the latest after these ludicrous puns one can guess that a bad joker must have conceived this game and accordingly the game does take itself with a pinch of salt. 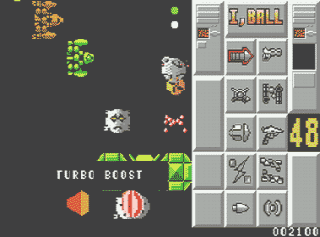 Iball starts the game only equipped with a somehow roughly shooting "Bubble Gun", to defend against the omnipresent attackers, but he can stockpile his arsenal considerably during the course of the game by picking up rotating disks , from which he can also get bonus points and extra time. The latter is urgently needed, as a scarce time limit of 50 seconds per level needs fast acting or one of the four lives will be lost. To absolve a level, Iball needs to be steered through a parcour of normal and deadly, electrically loaded obstacles within the time limit to reach the home straight at the upper end of the track. For the time that is left, there are bonus points. Extra lives can exclusively be gained by collecting bonus disks. IBALL! IBALL! I-I-I-I-BALL!!! OH NO!!! GAME OVER!!! 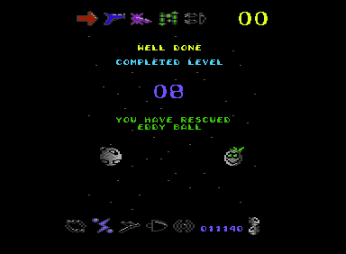 I, Ball was released as a budget title and is therefore graphically rather inconspicuous, if in places rather colourful. 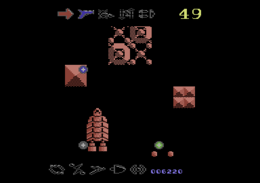 The blocky obstacles are as lean with details as the half a dozen different enemy sprites, which on the other hand are always displayed without any glints. The scrolling is programmed neatly. Not so successful is the controls of the own pawn: The moment of inertia during the movement and the bouncing off from obstacles are cleary too strong, so that even with careful steering it can quickly happen that unwanted crashes with deadly objects happen. The rather poor colllision query here decides to the disadvantage of the player definitely too often, sometimes you just need to get close to a danger to lose a life. It is remarkable that there is additional space for the display of the already collected extras in the upper and lower part of the screen (similar to Delta). Rob Hubbard "honored" the British Synthopopper Cabaret Voltaire in his design of the background music by a remix of her songs "Whip Blow" and "I want you" from the album "The Covenant, The Sword And The Arm Of The Lord" from 1985. By mixing the characteristically rather different pieces to a lively mixture somewhere between claustrophobic disco and cybernetic funk, he managed to create a lively and diversified track with scary undertones. If one doesn't like it, he can switch off the music and get instead sound effects from the upper middle-class. Furthermore the game got given three short digi-samples: an incentive "IBALL!" in the title screen, an "OH NO!" when losing a life and a "GAME OVER!" performed with a distinct British accent, which all three can satisfy. 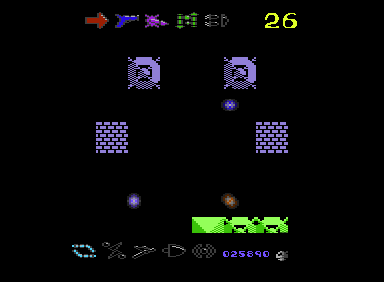 Simon Pick who performed and created the voice samples for this game used the same technology employed in his C64 games Microrhythm and Slimey's mine. The game does not have a highscore display. The only possibility to save a highscore is to quickly react in the moment when you lose your last life, and save a screenshot in the emulator or pull out the digicam very fast and make a picture on the real thing. For this you have about half a second. Very unsatisfying! Extra weapons can be obtained by touching the bonus disks and they will always appear in the same order. The Turbo-Boost can be fetched right at the start of the game, by collecting the disk, which materializes left to your start position. 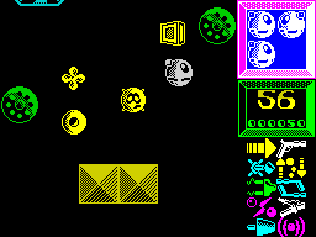 Collected extras are displayed in colour at the upper and lower border of the screen. After losing a life you will lose the last extra that you picked up. BEWARE: the bonus disk can also be shot - as it is with the enemies. If sound effects instead of music are activated, the appearing of a bonus disk is announced with a sound effect. Smart Missile: Destroys all aliens on the screen when pressing Space . Can only be used once! Bullet Spray: Iball can spray upwards and downwards at the same time. Molecule Bomb: Avoids for a short time that new aliens form by pressing M . Only once available! Electro Shield: Immunises against electric obstacles for a short time. Duration is shown by a decreasing time bar at the upper right of the screen. Hyperspace: Instant teleport to the goal. Twin Laser: Iball can shoot to the left and right at the same time. Fuel Injection: Raises the vertical moving speed. Hyper Brakes: Improves the braking performance, but only for a short time. Laser Cooling Unit: Avoids overheating of the laser. Rainbow Ripple Laser: An extensive, kaleidoscope-like laser. Between the weapons you can also receive bonus time, extra points and bonus lives. There is also a bad extra, the "Faulty Disk", it provokes that until the loss of a life or the end of the current level all obstacles get electrified ! 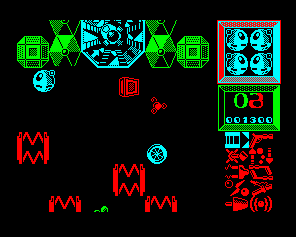 These rather nerving extras only appear after collecting the "Twin Lasers", which is later in the game. HalF time: Eddy Ball, the impertinent fruit, was rescued. I : play sample "IBALL!" O : play sample "OH NO!" 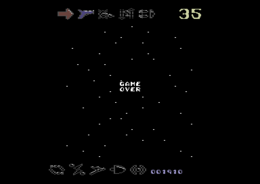 G : play sample "GAME OVER!" The samples can be pitched up or down additionally by and . The end: Well, that the end of the game turns out to be so meagre, might one have imagined already. Not even a victory serenade. What a pity! The laser will overheat after some time, so you need to do fire pauses. With this it is also avoided that the bonus disks are shot unintentionally. Enemies need some time to materialize. While they still flicker in multicolour they are still harmless and you can fly through them. Smart Missile and Molecule Bomb are useful, if you need calmness while manoeuvring at a difficult point. Collection the hyperspace should be left until level 7, as here is the first really hard situation. Slow and thoughtful flying is safer despite the time limit. It only happens from about level 10 that the time gets scarce. The version by REMEMBER has all thinkable trainer options. 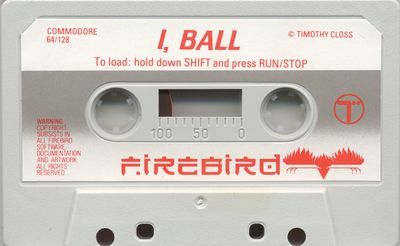 Robotron2084: "I,Ball: it is primarily a straight SID tune by Rob Hubbard, enriched with some samples, to which as it were a middle, but at least colourful game had been attached afterwards. There is not much inventive, except for maybe the cute story. A steeplechase with extra weapons and frustrating control, which makes the actual difficulty grade. No question: If I had spent 10DM for it in 1987, I would have been very disappointed. But as I had artfully copied it at that time, I remember the small shooting eyeball and its funny friends positively and I shortly played the game again and again, however, always with the same consequences: a rage attack after not later than a quarter of an hour. But actually one plays I,Ball only because of the music, and that is really top! 6 out of 10 points." TheRyk: "Fiddly controls and rather poor basic equipment of the ball make this rather hard to learn. Once you got some feeling for it and found some of the more helpful upgrades, it is even a little fun, but only until you rush into obstacles which happens quite frequently, unless you know the levels by heart. For sure Hubbard's music is worth some bonus, though it mostly sounds like Bangkok Knights ingame music plus samples. Even though the speech FX can be regarded as spectacular for that time, they can't make I, Ball better than an average budget game, so-so 5 points." The title is a pun from the word "Eyeball" and the title of the book "I, Robot" by the American science fiction author Isaac Asimov. Clip with the music of the game.